Around here, I love using mason jars decor to help create a country/farmhouse look that I have been a fan of for years. They just have this ability to give your home that country vibe without needing to do any re-painting or serious decorating. One of my favorite things to do for budget home decor is to find upcycled mason jar craft ideas like this DIY mason jar succulent planter. Not only is it a super simple mason jar craft, but it has that farmhouse decor look while bringing a bit of life to your home in the succulents! These DIY mason jar succulent planters are even easier to make than my DIY upcycled Mason jar succulent vase. Either way, these upcycled mason jar craft ideas are great for when you want to change up your decor and not spend a ton doing it. 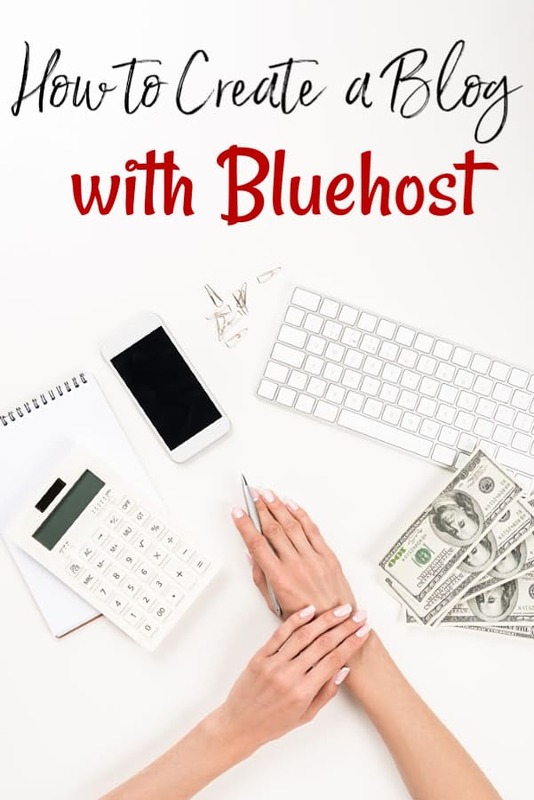 You only need a few items and you’re off and running to the races! 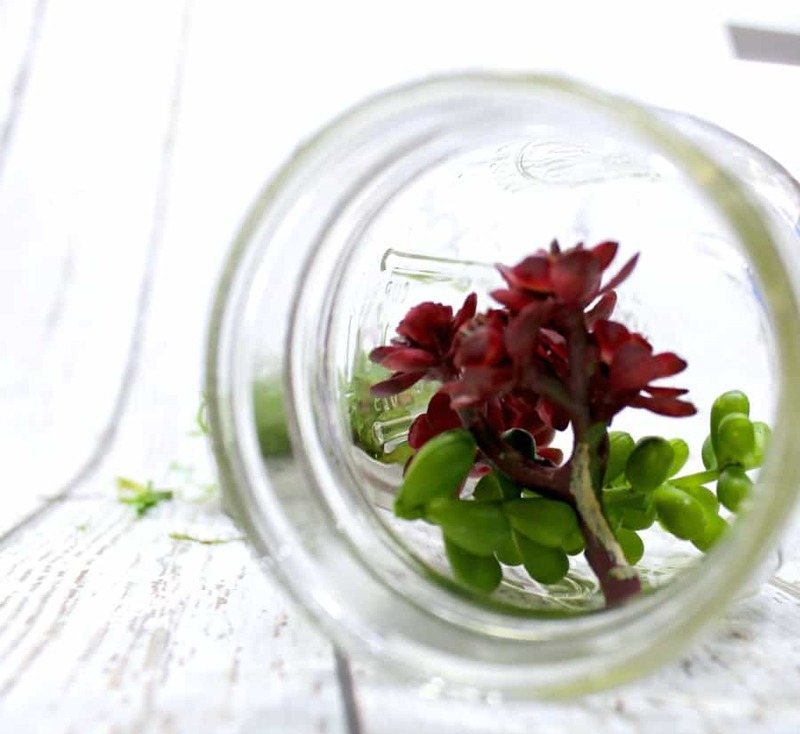 These mason jar succulent planters also make fantastic DIY gift ideas! Succulents are notoriously easy to care for and don’t require nearly as much care as other plants. In fact, there are quite a few different mason jar gift ideas that would all pair very well with this mason jar succulent planter to make a homemade gift basket. For someone who loves mason jar decor, these upcycled mason jar craft ideas would be the perfect – and memorable – gift idea! When you buy your succulents for your DIY mason jar succulent planter, you can target specific seasons pretty easily. For spring and summer; keep your colors light with greens mixed in. For fall or winter; reds, yellows or oranges will work very well. I don’t know about you, but I adore decor that I can match to the seasons! To start, use the hot glue gun to add a layer of glue to the bottom and sides of your mason jar lid. 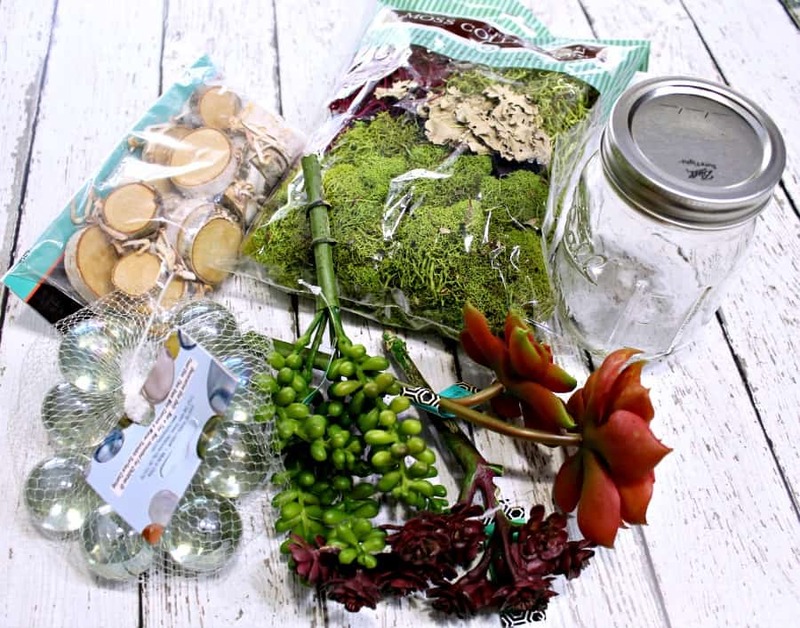 Add in a small handful of moss making sure to use enough to create a strong base for your DIY mason jar succulent planter. Set it aside and allow the glue to dry fully. 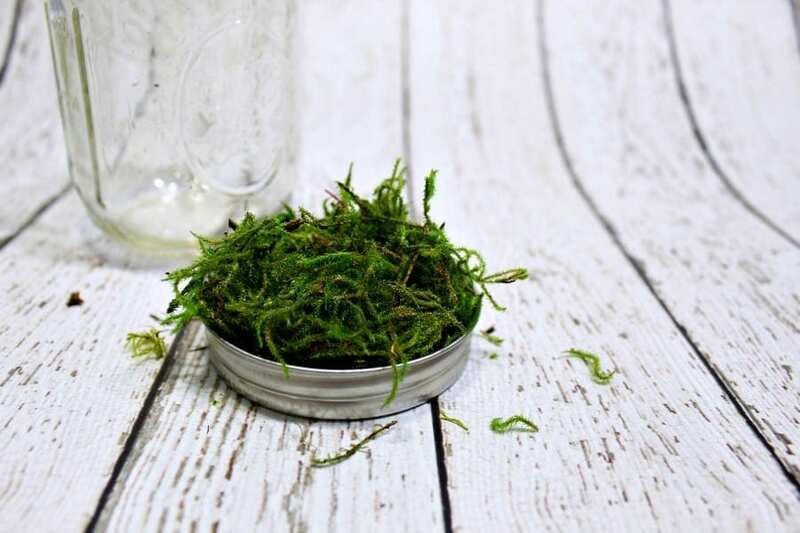 Once it is fully dry, add the lid and moss to the inside of your mason jar. If you want to make sure it doesn’t slide around at all, add a dollop of hot glue to the underside of the lid before you seat it inside the jar. Side Note: Looking for more upcycled home decor crafts? Check out THESE upcycled Starbucks bottle fall vases! They’re perfect for displaying your favorite flowers during the fall or winter months! 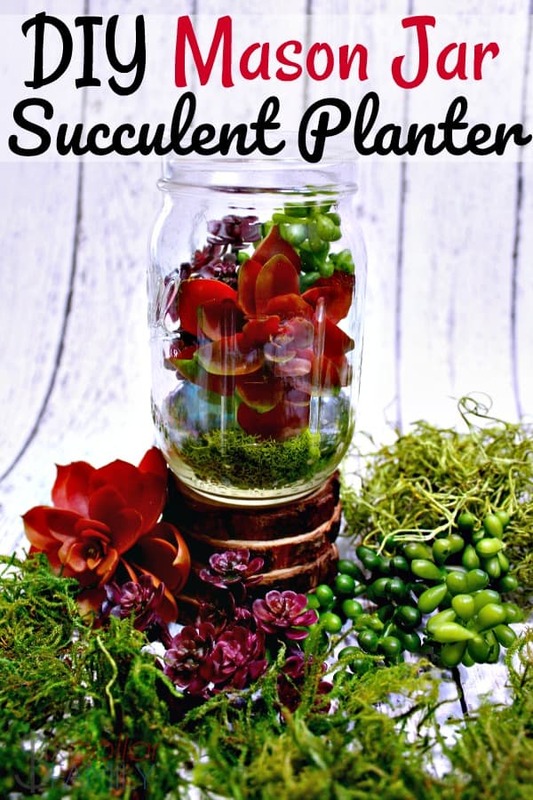 Once you have the lid seated in the jar where you would like it, add any succulents you want to the jar sitting them on top of the mossy lid. If needed, use a pencil to help guide the succulents where you would like them to be. If you find yourself having trouble placing the succulents for your DIY mason jar succulent planter, turning the jar on its side can often help at first. 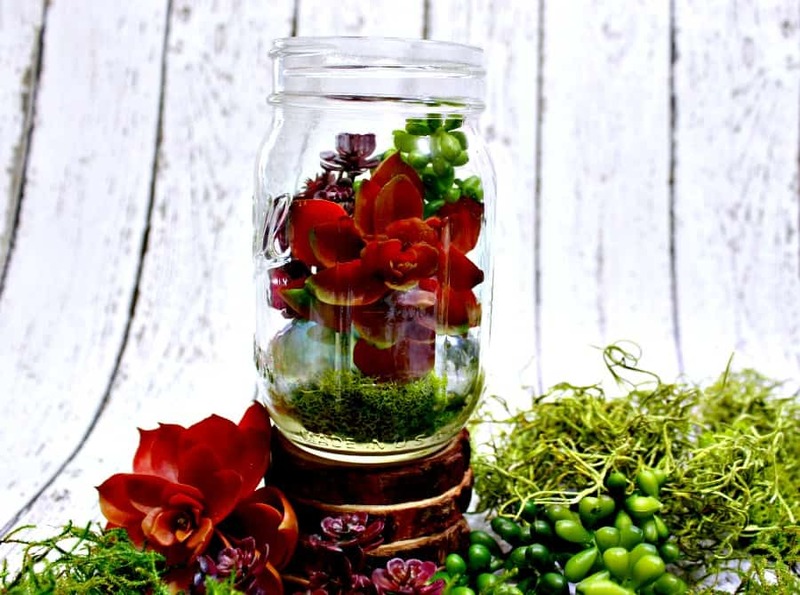 Once you have your succulents placed, add a few glass marbles down into the jar and around the lid to help finish off the look. If you would want to continue, this upcycled mason jar craft ideas makes a fantastic centerpiece for a summer or fall tablescape. To do that, stack 3-4 birch discs in the center of the table and finish by laying more succulents and moss around them. Keep in mind that if you’re using real succulents, they will eventually need to be planted in order to keep them alive.